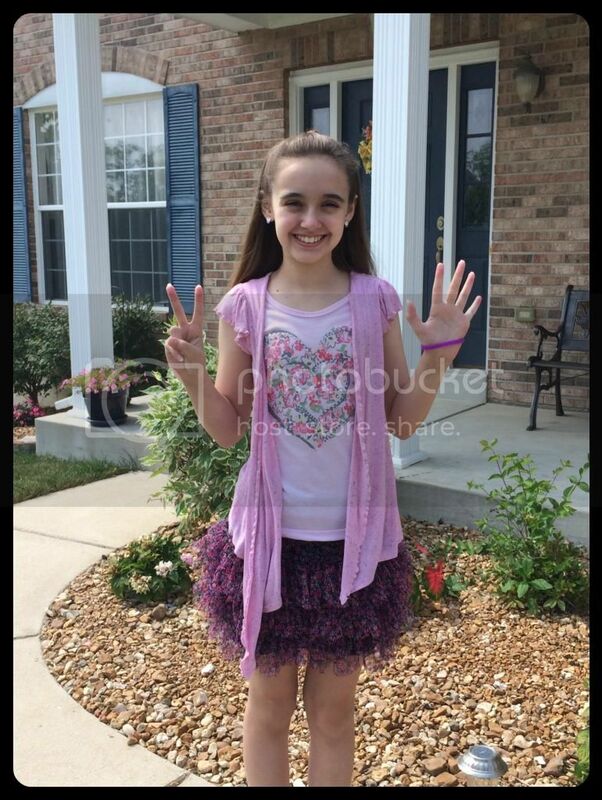 It's official, 7th grade began this week. It wasn't just the start of a new school year, but also our new philosophy for schooling a child with chronic illness. Normally, we begin with mostly full days of school; starting out as we intend to go forward. However, this year I'm trying very hard to stick to my plans to create a more relaxed schedule for Amber to combat her exhaustion. Monday was our official first day of school. 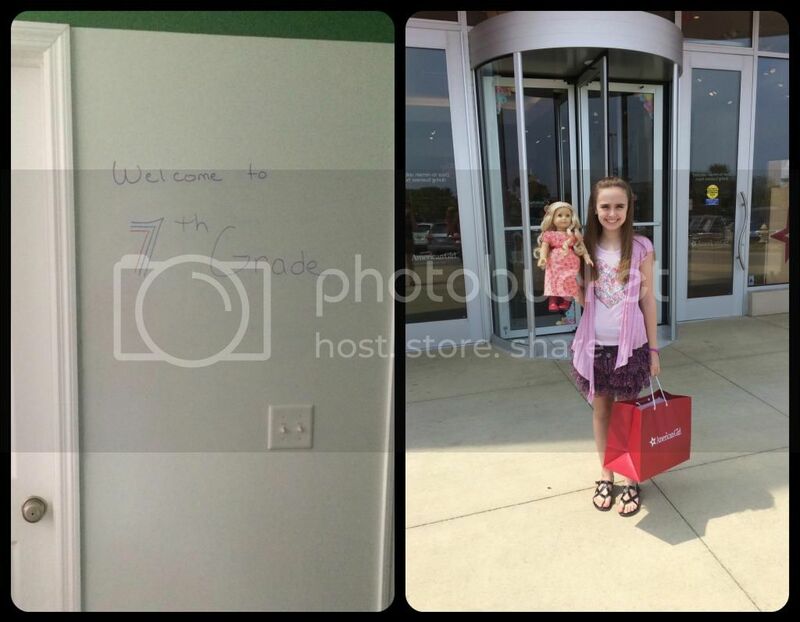 We started with first day pictures, a quick trip to the American Girl store, and lunch with Grandma. Then back home we went over the plans and expectations for the year. Amber was especially happy to find out that she doesn't have to take as many notes this year. We started both Analytical Grammar and history on Tuesday morning before Amber had a friend over for the afternoon. So far we are pleased with the new grammar, even if it is a little boring compared to the BJU grammar. Still, week one of grammar is in the bag and only nine more to go before we finish Season One and move into review mode. We still love our dry erase wall! And the first day shopping trip with lunch. Amber loved history this week and still can't believe she doesn't have notes or outlining each day in history. She does write at least once a day, but not always in history. Actually, she only wrote a small summary in history this week and the rest of her writing was in Writing With Skill that she picked back up on Wednesday. We held off on starting German and math this week. When it came time for school it just seemed right to start even slower than I had planned. I also felt a little off for a good part of the week. Not exactly sick but not exactly well either. 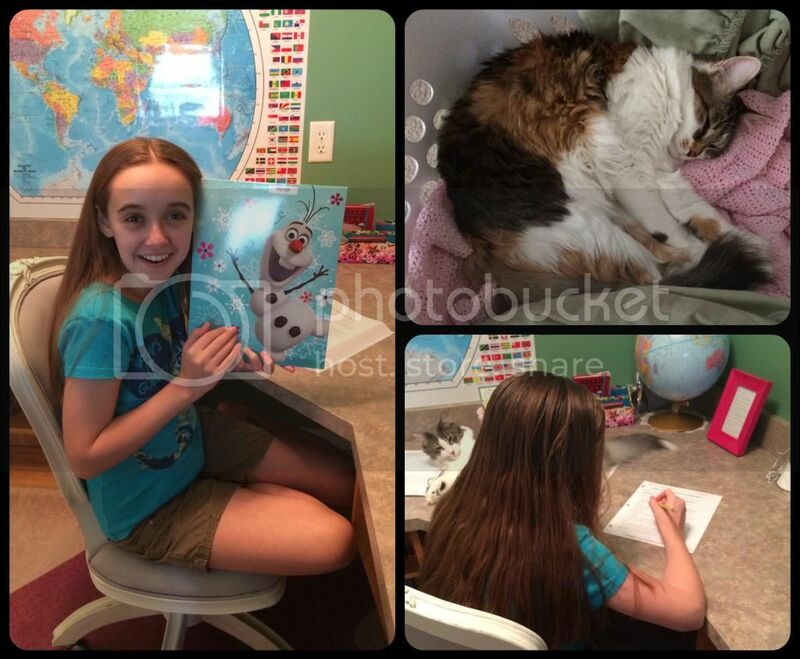 We made adjustments to Amber's homeschool co-op classes too. We don't start those classes until September, but there is no way even waiting a month that Amber will be able to tolerate the Teen PE class she had registered in. Instead Amber has transferred to Chess Foundations and kept her drama class. We also are holding off on starting Amber's treatment plan given by the neuroscience doctor, which includes a detailed exercise schedule. Amber has some testing coming up in August and September and the results will be altered if the treatment plan has any effect. (RIGHT-TOP) School is hard work for the kitties too. (RIGHT-BOTTOM) Grammar with her kitty buddy, Milori. He rarely leaves Amber's side during school. I also made another school purchase this week. After spending weeks this summer working on plans for Amber's history, literature, art and writing lessons for the year I realized last week that it probably wasn't even enough for the entire year. I also felt that our plans might be missing some depth needed for Amber's age. After some research I discovered that I had almost directly recreated Tapestry of Grace, even using many of the same reading selections. Instead of trying to find more ideas for this year I decided to simply purchase Tapestry of Grace Year 2, and I couldn't be happier with this decision. It took me two hours to review the lessons and select the features I want to add to our existing plans. If I truly have not planned enough for the school year, there are still more units in Year 2 of Tapestry prepared and ready for us to use, otherwise they will be there for 8th grade. Then in high school, we can reuse this level of Tapestry for history, government, literature, writing, and art. Unless we just can't tolerate Tapestry of Grace, I think we will be using it from here on out. It will certainly make assigning credits easier in high school and I potentially can use it for the adopted child (whenever that happens). 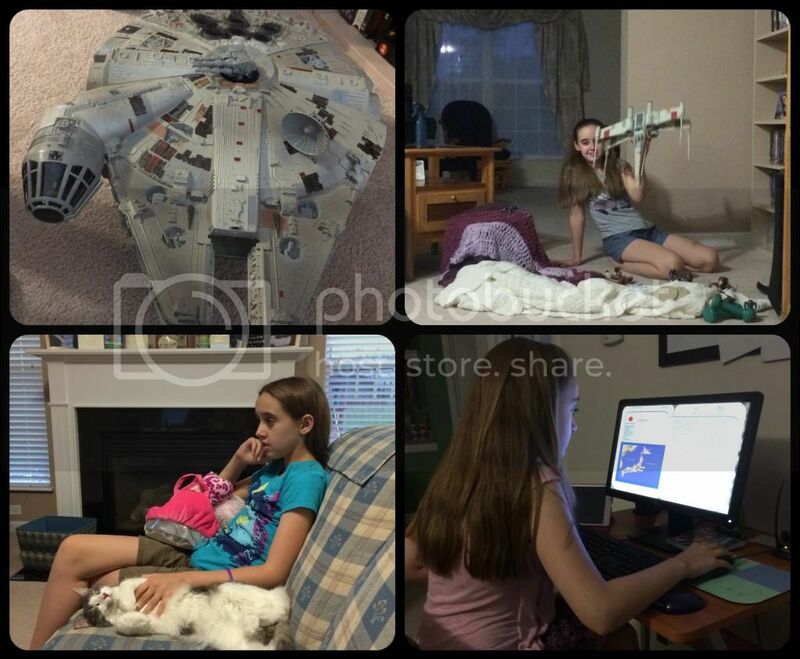 (TOP) My anniversary present from Fred - it's an old old Millennium Falcon in pristine condition. Of course Amber wanted to play with all her toys then. A great battle ensued. Today we are swimming at the indoor pool with the homeschool teen group. Amber is excited to see her friends one more time before the official kick-off of the homeschool group's year. I just hope I can keep Amber from overdoing it and being sick this weekend. We have nothing special scheduled this weekend and that suits us perfectly. It's the last weekend of summer Sunday school which means it's the last week of sleeping a little later on Sunday. Apparently, it's time for regular life to resume. Hurray Amber! First week of school. We now use a block schedule to cover subjects and shorten our learning day (at least from what it was last year). It's working out well but did extend our school year a bit. Thanks for sharing your plans. I'm visiting from Weekly Wrap Up. I look forward to hear about your experiences with Tapestry of Grace. I like what I hear about it. It was a great first week under your belts. Amber looks radiant! You're new more relaxed way of living and doing school looks like it's agreeing with her!. Aw, the kitty looks so cozy in the laundry basket! We always have at least one dog "helping" us with school! It's so great that you're able to be flexible and keep an eye on your daughter's energy levels, etc. Sounds like flexibility will be the key to keeping her healthy! What a great first week. We start Monday and I am so afraid that Keilee has over planned herself. I am way more relaxed than she is. I think this will be an amazing year for Amber and I hope she just loves it! And you too! :) She always looks so happy in pictures.